A study has found the How You Remind Me rockers aren't as successful as another Canadian rock outfit. Nickelback have long been a figure of fun by the media and music fans alike, but the one thing they could always rely on was the fact they were Canada's biggest export... If you don't count Celine Dion, of course. But, according to a report on 10 and 3 (via The Huffington Post), Chad Kroeger and co. can no longer boast about being the most successful group in their beloved nation. Instead, the report names Tragically Hip - a Canadian rock band from Kingston, Ontario - as the "most successful and well-loved" outfit, of the last 50 years, having more longevity and number one albums overall. 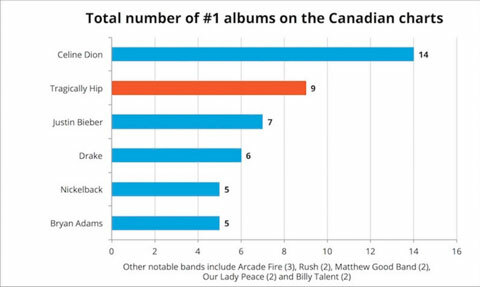 The 10 and 3 explains: "After digging into historical Canadian album charts, and considering metrics like weeks at #1, longevity, and breadth of album success, the answer could not be more clear: The Tragically Hip are without a doubt Canada’s most successful and well-loved band of the past 50 years."